Biography: Joanne was asleep in the back seat of a car on her way home from seeing the rock opera Tommy in Montreal, on Friday November 18, 1983. She received severe head injuries and was clinging to life with support for two days. Joanne was taken off life support on Sunday, November 20th, 1983 and died shortly after. Mr. and Mrs. Ott donated Joanne's organs to grateful patients who received the gift of life from one of the best persons to have ever walked this earth. 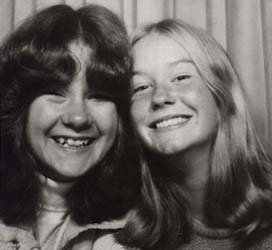 Joanne was and still is the best friend I ever had. Jo loved life and was getting her life on track at the time of the accident. 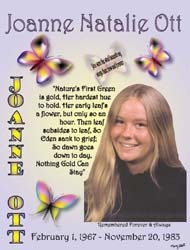 Joanne was very outgoing and had many friends. Her passion was riding horses. One of her favorite songs was Old Man by Neil Young. I was a quiet and shy kinda person and Jo brought me out of my shell. She truly was a gift in my life. Joanne was beautiful through and through. Lots of memories are forever cherished. We went on an exchange to Vancouver in the summer of '83, and had an awesome time. Our favorite hangouts were Dorval Ave., and Pine Beach Lake, soaking up the sun, listening to tunes and playing frisbee. I remember when she found a four leaf clover at the back of Dorval Garden's school, and the times she walked me all the way home with her dog Nanny, and I would say "but Jo, if you walk me home, you will be walking home alone", and she would say "no, I have Nanny to protect me". Joanne always stood up for me and looked out for me. We were both Aquarians and had so much in common, my daughter's middle name is Joanne; and her sister Lori Ott, named her daughter Joanne, "Joey" for short, as Jo was called by her family.